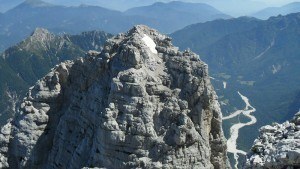 Jof di Montasio (2754 m) is the Italian name for the mountain known also by its Slovenian name Montaz. The mountain is to the southwest from the small town of Tarvisio in the north-east Italy. 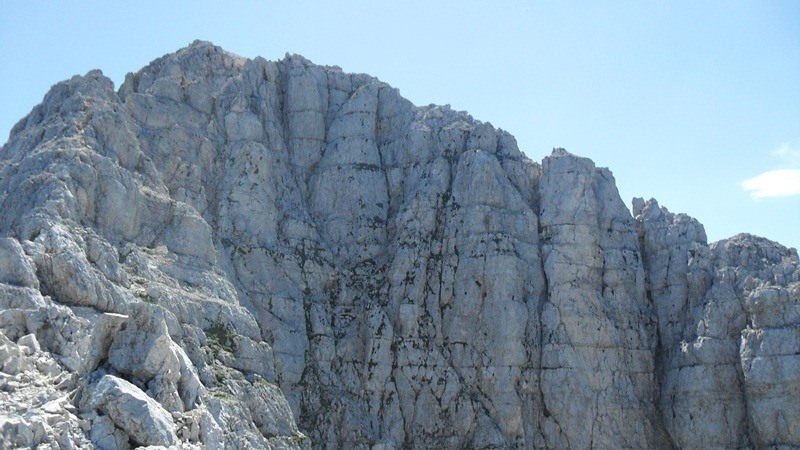 In this page, I describe the route to the summit from the south side. Jof di Montasio belongs to Julian Alps, and this part of the Alps is apparently named after Julius Cesar. 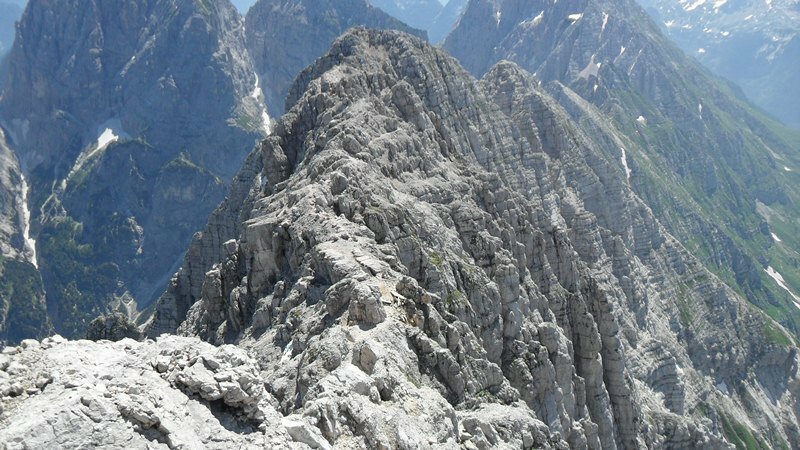 These are eastern limestone Alps, with the highest mountain Triglav across the border in Slovenia. 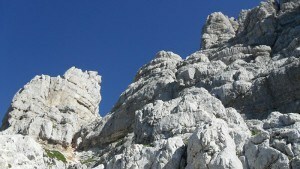 The north-east side of the mountain is a paradise for true rock climbers, and there are many ferrata routes from this side. Much more easy is the approach to Montaz from the south side. You may use the convenience of a relatively high access by car to about 1500 m above the sea. You arrive at this mountain plateau by following a narrow road from the valley, which starts in Sella Nevea village. 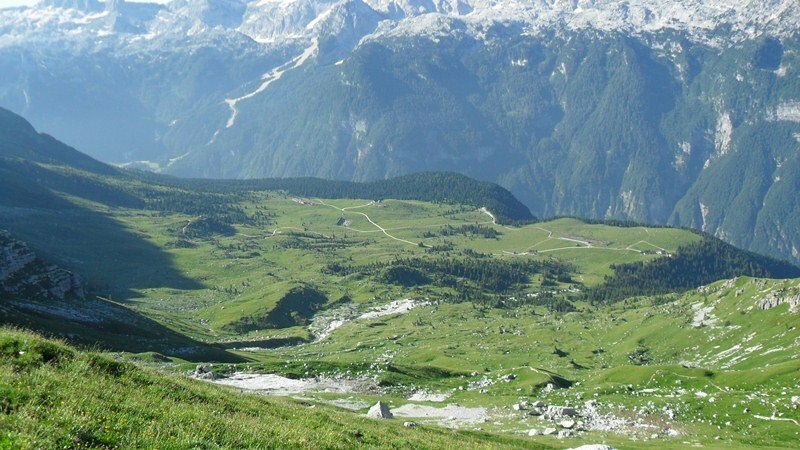 There is a lot of space for car parking there, and from that point, just follow an easy hiking route which will get you to the Rifugio Brazza, at around 1650 m above the sea level. 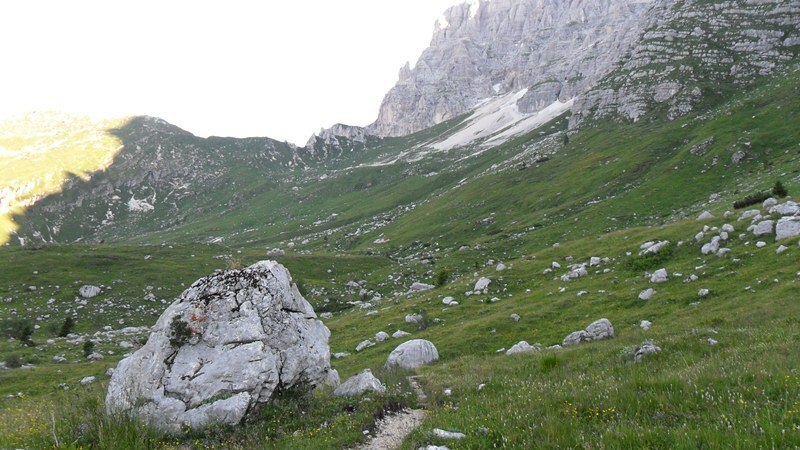 When you pass the Rifugio, the path will split so you continue to the left across pleasant meadows, gaining altitude all the time. You cannot miss the direction. The paths are everywhere, you may also follow some of those that are more direct, avoiding the Riffugio. They all go toward the rock wall in front of you. Very close to the rock you will have to decide either to go left toward Findenegg Couloir and Suringar bivouac (2400 m), or to go right and take the Pipan ladder route. 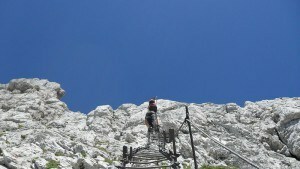 The Ladder is a 60 meters long steel construction built in the rock wall. So for this route, you will need the usual ferrata equipment, a harness and a y-rope, and helmet. This route is shorter and more direct. 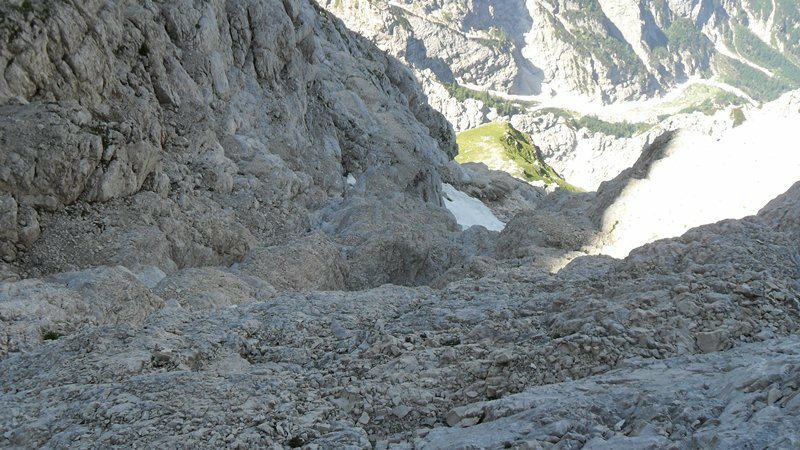 The first part of the Findenegg Couloir route is not steep but it is a bit exposed, you follow the route along the steep cliffs and there are a few fixed cables at one section. 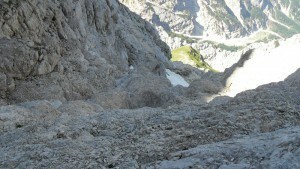 Before reaching the bivouac you turn directly up to the steep Findenegg Couloir. But I definitely suggest walking some 50 meters more to visit the Suringar bivouac. 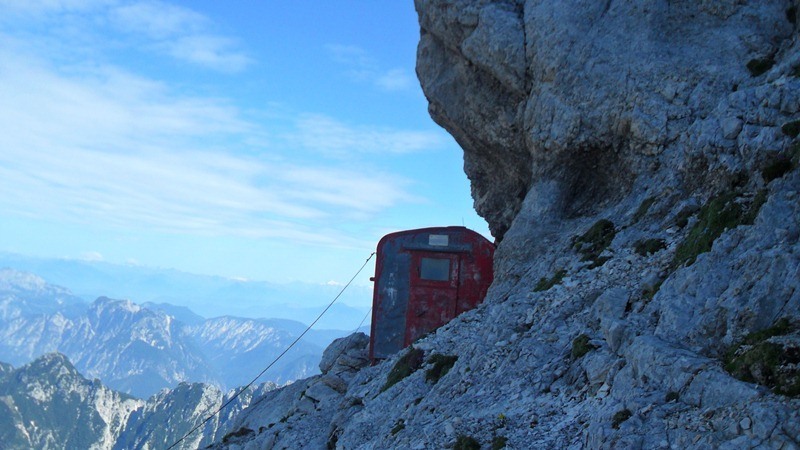 This is a typical Alpine construction, a red-colored iron container with several places to sleep. The Couloir route is a scramble where you need to be focused and watch steps. The rock is good most of the time, but there are sections with loose rock and it is better not to have people above you at such places. 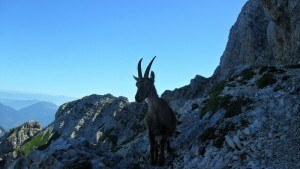 I did not have such problem as I was alone all the time, only wild goats around. Eventually, you will get to a narrow ridge where you will be rewarded with breathtaking views. The ridge is exposed at some points so do not enjoy the views too much, better watch your steps. The summit will soon be visible and the final 200 meters are rather easy. Here are a few photos so you may get a clear impression about the route described above. Nice walk from parking toward Rifugio Brazza. From Rifugio Brazza toward the rock. 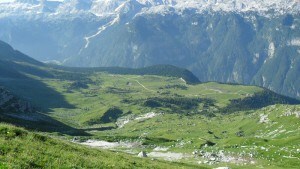 View back toward parking and Rifugio Brazza area. 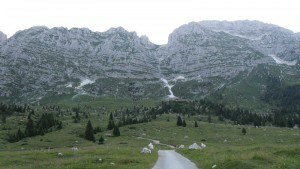 The lower part of the route, people and wild goats. The route is somewhere here. Walk along galleries, an easy part. This is NOT a zoomed photo. View down the Findenegg Couloir, more steep in reality. At the end of Couloir, and view toward the summit. Climbers are somewhere there if you look closely. 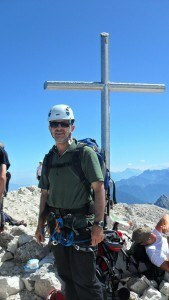 Me proudly on the summit. Montaz can be climbed by anybody with normal physical conditions and with a bit of experience in rock scramble. 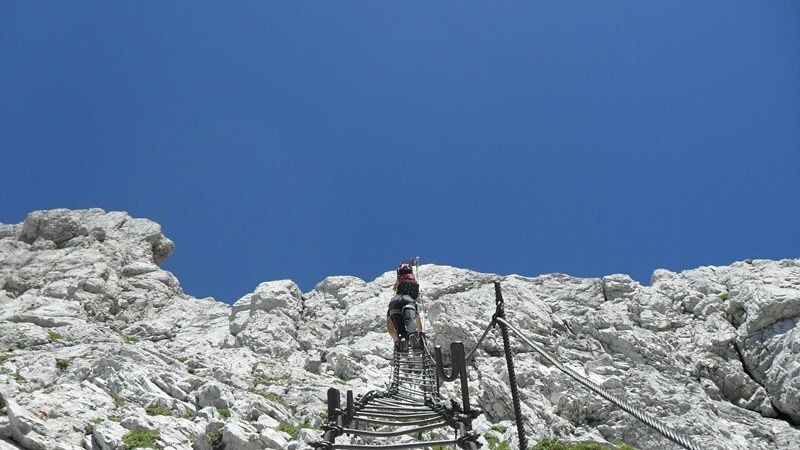 I have seen people of every age there, the mountain is popular and there were many climbers on the Pipan ladder route. In early season there may be many dangerous passages with snow. In this case, definitely have a mountaineering axe with you. 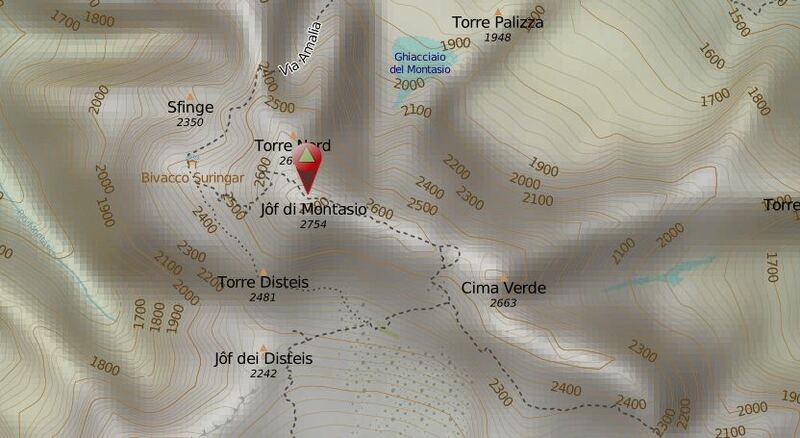 My climb to Jof di Montasio was a day after I climbed Mangart in the same area. This was a solo tour in July 2010. 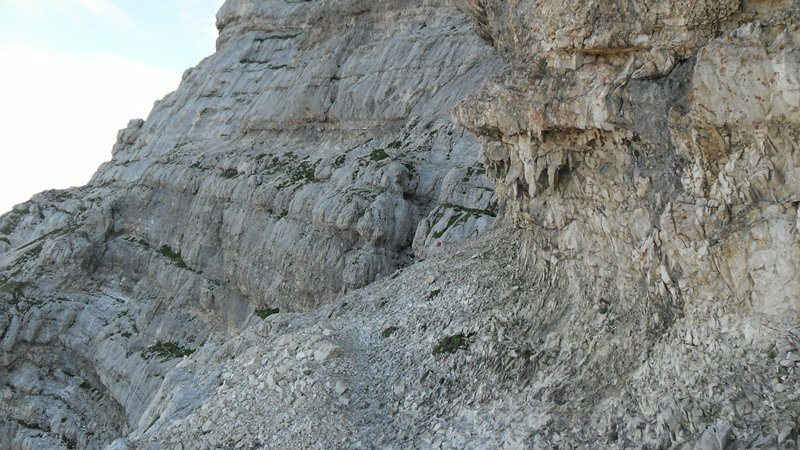 I slept in the car on the Mangart saddle and set off from there early in the morning following the signs to Passo di Predil, and then along beautiful Alpine valleys toward Sella Nevea. 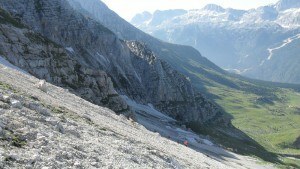 My plan was to traverse the mountain, ascending by Findenegg Couloir and descending along the Pipan ladder. It was a long drive from Mangart, so I started from the parking a bit late, at 6:45 am, and 5 hours later I was on the summit. So it was a relatively long tour, longer than I expected. 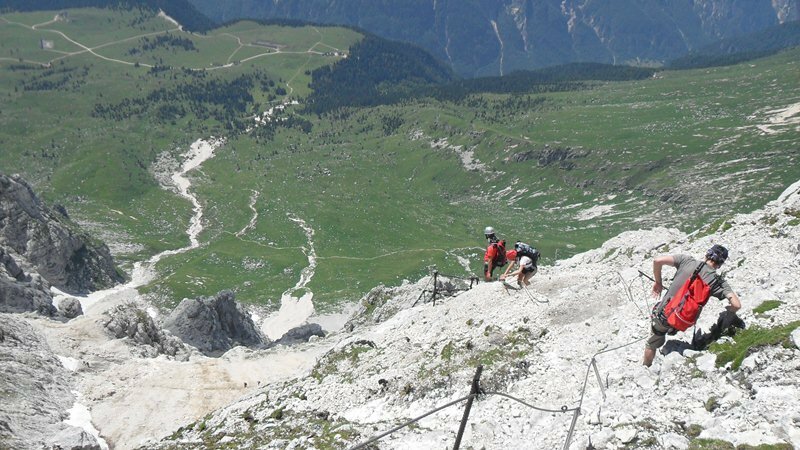 There were many people on the meadows from Rifugio Brazza to the start of the rock routes, the weather was simply the best what the Alps can offer, so the mountain was crowded. 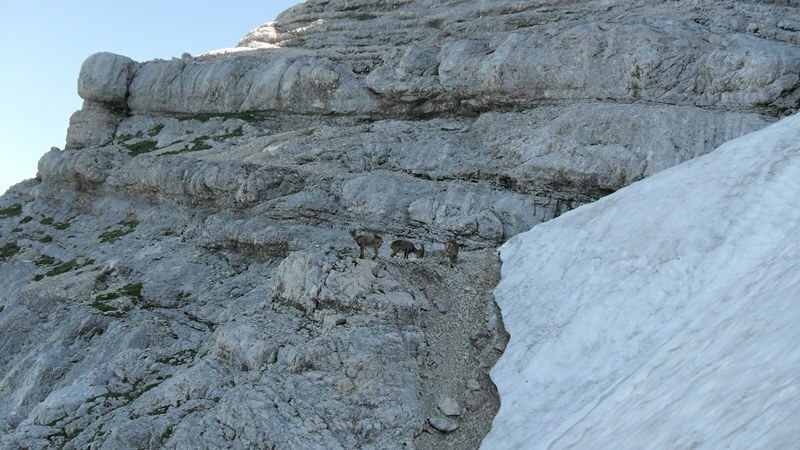 There were tens of Alpine wild goats around. I have never seen them so many on any mountains before or after that. I was surprised to see that all the climbers went toward the Pipan ladder. So when I turned toward Findenegg Couloir there was nobody around. At one place I had to cross snow and it was rather scary. I did not have crampons, so any mistake would take me at least half a kilometer down the mountain. I guess that was one of the reasons why everybody else was on the other route that morning. The Couloir was in shadow most of the time and it was a bit chili. I made a break at the refuge, accompanied with a wild goat which was standing practically just two meters in front of me, it is in the picture here. I then continued to the Couloir, there were no problems, at exposed places I tried not to look down, and it was smooth. 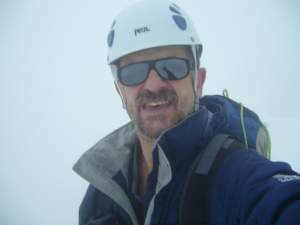 At the ridge section, I was rewarded by the sunshine, which was pleasant after the dark Couloir. There were some roped alpinists on a nearby sharp peak and I enjoyed watching their progress. 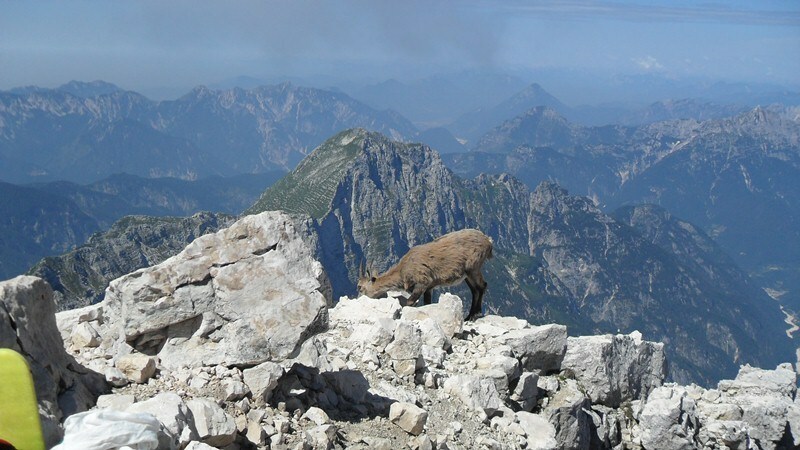 Alpine goat on the summit. There was a crowd on the summit, and one goat again, exactly on the top, apparently undisturbed by people. I stayed at least half an hour at the summit, the usual stuff, taking photos, having breakfast, and then descended towards the Ladder. I was carrying three liters of water and this was hardly enough. It was a warm day. My descending route, toward Pipan ladder which is somewhere on the right, not visible here. So to stress again what you need to climb Jof di Montasio: first, good hiking shoes and a helmet. You must have the helmet if you take the Ladder route. People about you cause rocks falling down, I myself was careless before stepping onto the ladder and soon I heard shouting from deep below. I guess the person was not screaming some kind words in my direction, but I realized soon he was without a helmet. This was irresponsible (from both sides). The Ladder is long and do not attempt it without a harness and a y-rope. These pieces of equipment are described on a page here within the site. Regarding accommodation please visit this post within the site with more information about renting a holiday flat in mountains. The normal routes to Jof di Montasio are harder and longer than those to Mangart, just to know if you are in a situation to choose where to go. This is primarily due to a much higher car approach when you go to Mangart. Please leave a comment below. I shall be happy to give answers to any questions. I haven’t been to Italy, but it’s in my to do list. And probably this summer i will be visiting this great country! I may be visiting those mountains also, but my travel route is a little bit different. But still i will try my best to make a visit there. Really good and interesting post! Keep up the good work. Hi Tyler, thank you for visiting my site. Italy has many great mountain areas, in particular in the north and the west, so you will find something for you. Best luck. thanks so much for a very well explained post, l used to enjoy climbing( not so high) but as time goes by my health do not allow climbing any more. But reading your post made me feel as lf l were actualy,physically climbing again. The photos look wonderful and l wanted to ask if you took them during your climb. Thanks for a wonderful informative read and for showing a beautiful part of ltaly that many may not know. Thank you Roamy for such kind words. Yes, photos are all mine and they show what I saw that morning, great that you like them. Such an intresting post ! Really well explained. I’m italian and never had the chance to go to Jof di Montasio. However I did some climing in corsica and I definitely recommend it to you. It’s near Corte in the middle of Corsica. If you have the chance to visit the island you should go there. I will be happy to follow more of your journey’s ! Thank you for the post. Hi Momo-Jones, many thanks for the input and for the recommendation regarding Corsica, I did not have chance to go there yet. Thanks for sharing this beautiful landscape of Italy with us. The pictures really help me to envision the kind of trails that are to be expected in this mountain. It’s pretty rocky, eh? I am more used to tropical forest trekking, so this looks interestingly challenging. Is it open all season for trekkers? Do you need to have any permits or pay any fees to climb this mountain? I’ll certainly bookmark this destination in my future travel plans. Hi Cathy, great to read your comment. Jof di Montasio is a beautiful Alpine mountain, no fees or permits are required. You will climb it in summer months of course although it is never officially closed. Many thanks.